Punch recording is a technique you can use to overwrite a portion of a previously recorded track, during playback, without touching any of the recording before or after that portion. You punch in to interrupt playback and make the recording, then punch out to return to playback mode. You can choose between two punch recording modes: Quick Punch-In mode and Autopunch mode. Punch recording is only available when Show Advanced Tools is selected in the Advanced preferences pane. A useful and common recording practice is to switch in and out of recording mode while listening to the previously recorded material, sometimes referred to as “punching in on the fly.” This helps you fix mistakes or create alternate takes for a particular section. To ensure the transition between playing and recording occurs without any audible gaps, you must turn on Quick Punch-In mode. When Quick Punch-In mode is on, recording occurs in the background from the moment you start playback. This means there needs to be twice the number of available channel strips than the number enabled for recording. A dialog appears if you exceed the number of channel strips needed. Important: It is recommended that you leave Quick Punch-In mode turned on (which it is, by default). You only need to turn it off if you’re recording more than the number of channel strips available (in a new project that’s more than 128 tracks), or if your hard disk is unable to accommodate recording a large number of tracks. To turn it off, choose Record > Allow Quick Punch-In, or Control-click the Record button, then choose Allow Quick Punch-In from the shortcut menu. Note: Only record-enabled tracks are affected by punch recording. When it comes to judging punch-in and punch-out points during punch recording, you should turn on auto input monitoring (which it is, by default). This setting allows you to hear the input signal only during the actual recording; before and afterward you’ll hear the previously recorded audio on the track. If auto input monitoring is turned off, you will always hear the input signal. Choose Record > Auto Input Monitoring. Control-click the Record button in the control bar, then choose Auto Input Monitoring from the shortcut menu. Choose Record > Allow Quick Punch-In. Control-click the Record button in the control bar, then choose Allow Quick Punch-In from the shortcut menu. Click the Play button in the control bar, then use the Record Toggle key command at the point where you want to start recording. Click the Stop button in the control bar, or use the Record Toggle key command a second time to stop recording. If you use the latter option, recording ends, but playback continues. Note: You can also use the Record Toggle key command when not in Quick Punch-In mode. However, this will cause a delay when you switch between playback and record modes, accompanied by a dropout of all audio tracks. Click the Autopunch button in the control bar. Note: You can add the Autopunch button by customizing the control bar. For information, see Customize the control bar. Option-Command-click anywhere in the ruler. The autopunch area is indicated by a red stripe in the middle third of the ruler, with the left and right autopunch locators serving as punch-in and punch-out points. Drag the Punch In and Punch Out locators in the ruler. Drag vertically in the autopunch locator fields in the control bar. Drag the cycle area into the autopunch area to quickly match the autopunch area to the cycle range. Place the playhead at any position before the punch-in point. A region that matches the length of the autopunch area is created. 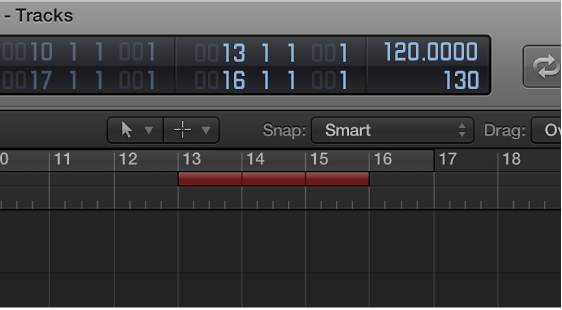 Any audio input received before the punch-in or after the punch-out point streams through Logic Pro as usual, but is not recorded.